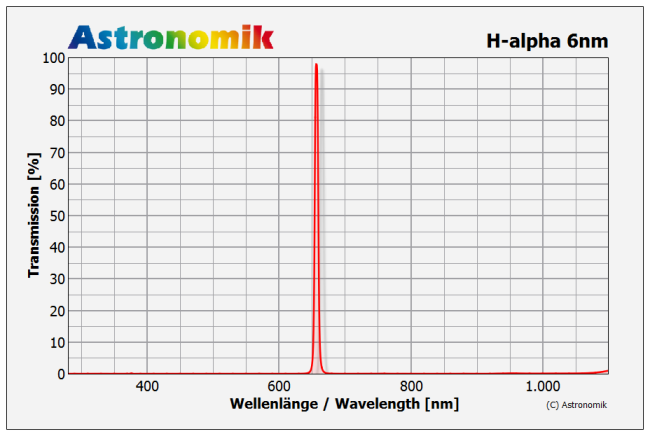 The Astronomik H-alpha 6nm CCD 36mm filter is suitable for imaging of Hydrogen nebulas from observation sites with light pollution and from dark sites as well. The contrast between an object glowing at 656nm and the background is increased enormous! The 36mm model is mounted with cell. Due to the combination of the narrow bandwidth of 6nm and the high transmission of typically 96% the filter gives you an contrast boost, as all unwanted light from other wavelengths than 656nm is blocked form UV up to the IR. This results in an very dark background compared with any filters with a higher bandwidth. The FWHM of 6nm is optimized with CCD or CMOS cameras with a low dark current. The 6nm filter is the best choice if you are observing from a heavily light polluted site or if you are imaging faint objects in starcrowded regions of the milkyway.